Only had a day in Tokyo so this was a good way to have an overview of the city. Best was seeing the beautiful Japanese gardens! This was a good overview of Tokyo and the history. A good place to start to orient yourself with the city. The tour was very well organized, but sadly the weather was not cooperating. It rainedly heavily during our morning excursions, thus putting a damper on our spirits. However, our tour guide, Nobu, was excellent. Very knowledgeable and friendly. Tour and guide were incredible. Lots of information and the shrine and temple were very beautiful. Great tour if you want a quick overview of the sites in Tokyo. Very nice tour. I did wish we had more time to visit each shrine, but I do understand that this is a half day tour. Other than that, I recommend this. It was pouring down rain the day we went, so it was great to have bus transportation, as opposed to trying to do a walking tour or walk to and from metro stations. Our guide was fantastic -- very knowledgeable about the sites we went to, Tokyo, and Japan in general. Because of the rain, the relatively short amount of time 40 minutes at each stop didn't bother me. But I think if the weather had been nice, I would've felt rushed. Thoroughly enjoyed this tour of Toyko. A great way to start our Tokyo trip getting to know the lay of the city. Our tour guide was very informative and we learned a lot of history, cultural information, and even Japanese architecture. 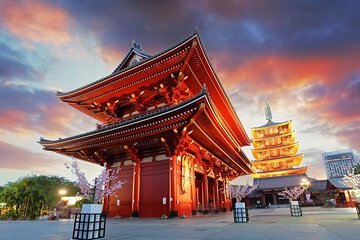 The Meiji and Senso ji temples were the highlights of this tour. Cultural overload in 4 hours! Highly recommend this tour for first time Tokyo visitors. The tour covers three sites. The main one's being the Meiji Shrine and Senso-Ji Temple. We also visited a garden. Our guide was great and I learned about some of Japan's history and the sites. The problem with this tour is the amount of time you spend on the bus. I was picked up from a hotel which was 25 mins walk from where I was staying I was in Shinjuku, which is a popular part of Tokyo. I then got on a bus from the pick-up point and we spent 30mins on the bus going to a bus terminus where we then had to wait again for another 30mins until the tour bus was ready to go. I noticed on the map that we actually passed Meiji Shrine on the way to the bus terminal. I was at the first site 2.5 hours after I left my hotel in the morning. This was a complete waste of time.